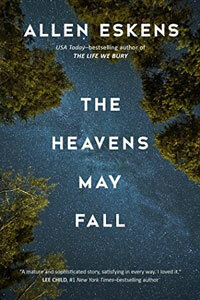 The Heavens May Fall by Allen Eskens, a Mysterious Review. Review: Max Rupert of the Minneapolis Police Department and defense attorney Boady Sanden are each trying to overcome demons from the past as they face-off in a complex murder trial in The Heavens May Fall, a crime novel by Allen Eskens. Max is still struggling to overcome the death of his wife four years ago, killed by a hit-and-run driver and the case was never solved. Boady still feels guilty for having lost a case six years ago for an innocent man who was sent to prison and subsequently killed by a fellow inmate. It was after his death that the real criminal was identified. Guilt-ridden, he left his law practice, moved to St. Paul and became a successful professor at Hamline University School of Law. The two men, however, remained close friends. Now a woman, Jennavieve Pruitt, has been found naked and stabbed to death in an alley wrapped in her own young daughter’s blanket. Even though there is proof that her husband, Ben, flew to Chicago for a convention of the National Association of Criminal Defense Lawyers, Max is sure that somehow he returned to Minneapolis and killed his wife and then returned to his hotel in Chicago where he was notified of his wife’s death. Both men knew Ben: Max from his police work and Boady, who once was in the same law firm as Ben. Ben, knowing Boady has kept his license to practice current, asks him to serve as his attorney. The story is told from each man’s point of view. No other suspects to the murder were found, and there were holes in Ben’s alibi about Chicago, so the case went to trial. Both Max and Boady are loyal to truth and justice. “Fiat Justitia ruat caelum—do justice though heavens may fall. If a person is ever presented with the choice, that person must always do what is right even though it may bring on a great personal loss,” And now their friendship is being pitted against justice and one crosses the line. How will this affect the outcome of the trial and their friendship? The story surrounding the development of the murder investigation and the trial make for a fascinating read. Interesting side-stories tell of the private lives of Max and Boady, how some law enforcement officials can manipulate some lawyers and judges to see their way of thinking, and of how some lawyers can cleverly craft the alibis that will affect the case. In-house police procedures are also an interesting part of the story. This is a great whodunit that keeps the pages turning until the shocking end. Special thanks to guest reviewer Betty of The Betz Review for contributing her review of The Heavens May Fall. Acknowledgment: Seventh Street Books provided a copy of The Heavens May Fall for this review.